Less than a month after it went live, Nintendo of America President Reggie Fils-Aime says nearly one million Wii owners have participated in the Netflix streaming video system, although he wasn't entirely clear on what "participated" actually means. When Nintendo and Netflix announced their partnership back in January, not everyone was convinced it was a hot idea. Unlike its counterparts from Sony and Microsoft, the Wii isn't capable of displaying hi-def content, and analyst Michael Pachter predicted at the time that Wii users would "embrace the Netflix service only gradually." But according to Fils-Aime, the uptake has been even faster than it was on the Xbox 360: Less than 30 days after going live, nearly one million users have "participated" in the system, he told CNBC. Whether that refers to people who have actually watched movies on their consoles or just ordered the free Netflix disc, however, was left unspecified. It took roughly three months for the Xbox 360 to hit the million Netflix users mark, but the service on the Microsoft console also requires a subscription to Xbox Live, whereas it's available free to any Wii owner with a broadband connection and a standard Netflix membership. 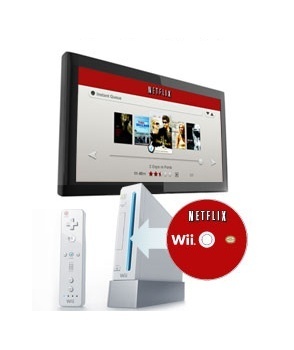 Another reason for the faster-than-expected adoption of the Netflix service may have to do with the number of connected Wii consoles; Pachter had estimated that less than 20 percent of them were online, according to GamesIndustry, but a more recent study indicated that more than half actually had a connection.